Do you know what youre doing? And if so, why? Does anybody? Yes - Mitch Benn does. He’s back, with guitar in hand, a spring in his step, a bee in his bonnet and giving a piece of his mind (there’s enough of it to go round). Hes come to ask searching questions and eat biscuits. And hes all out of biscuits. A stalwart of BBC Radio 4s Now Show for more than a decade, Mitch has also presented many radio specials. 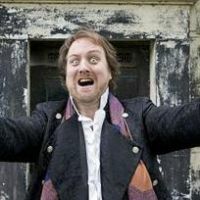 Following on from the success of Mitch Benn Is The 37th Beatle, a further three specials on music icons Bob Dylan, David Bowie and Elvis have been broadcast - The Freewheelin Mitch Benn, Mitch Benn Is The Fat Pink Duke and Mitch Benn Has Left The Building. He also co-presented with Harry Shearer BBC Radio 2s Anatomy Of A Guitar and presented Spank The Plank for BBC Radio 4. He also appeared on (and won) BBC1 televisions Celebrity Mastermind! Mitch is the author of two novels, Terra and Terras World both published by Gollancz and co-author with Jon Holmes of The Twitter History Of The World the paperback edition of which was published by Prion Books in September 2015. He also writes for The New European.